Seasoned marketers know that place matters. What does this mean? It means that, despite living in a world that is increasingly virtual for so many of us, most of us still care (and should still care) about where our businesses are located in geographical relation to our best customers and prospects. Yes, for many businesses today, there is no mistaking that place matters; geography matters. At MindEcology, one of our jobs is to show our clients where their best prospects live and work. While we do our “best customer” analyses using data and numbers, we find that we are able to get our analytical findings across to customers most effectively when we use visual representation or “data visualization” for that data. One form of data visualization that we find most effective is the use of color-coded geographical heat maps. As the name implies, a geographical heat map employs a color scale in order to differentiate between various attributes of a geographical area. Various colors (say: red, orange, yellow, green & blue) are assigned to different geographical units (sub-sections) within a trade area as a way of indicating the attractiveness of each sub-section of the trade area in question. For example, we may designate the color red as “hot” and blue as “not,” with the colors in between falling somewhere along that “hot-to-not” scale. The two most commonly-used geographical units that we employ for our heat maps are zip codes and block groups. Most people are familar with zip codes – but less so with block groups. Zip codes were created by the post office years ago as a way to mark off large areas of land for the purposes of sorting and delivering mail more efficiently. Meanwhile, block groups were created by the United States Census Bureau; they represent the smallest unit for which the bureau publishes statistical data on households. These are two completely independent systems of geographical demarcation, so the block group and zip code boundaries for a given area rarely line up perfectly. In general, block groups are smaller than zip codes (although this is not always the case). On average, the average block group covers an area that is 3-5 times smaller than the average zip code. So, which of these two systems of geographical units should we use for your heat map project? That depends, of course. In general, zip codes are best if you plan on implementing a direct mail, newspaper, radio, or billboard campaign and you want to know where your best prospects are. However, if you plan to apply the results of our analytics to helping you select the exact spot for your next store location, using block group-level coding may be able to give you better granularity in order to help you choose specific shopping centers or street corners on which to set up shop. 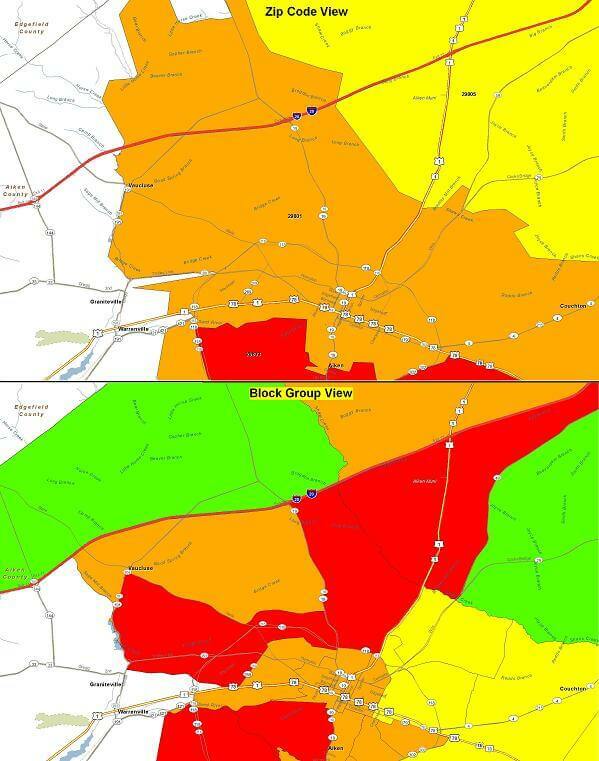 For example, the following two maps show the identical geography at the same zoom level – a location near Aiken, SC. Notice how the zip code view (upper) indicates only 3 zip codes, while the block group view (lower) shows at least 7 distinct block groups. You can see much more of a color variation (and therefore targeting granularity) with the block group view, but using block groups may be too granular if you are interested in considering this area solely as part of a market level analysis.